Pop, Rock, Traditional or African Drumming? Music Generation Laois are delighted to announce that bookings are now open for our Summer Camps for 2016. This year will see a variety of camp choices and a range of musical genres. Our experienced and renowned tutors will work with students to unleash their creative side through classes, workshops, performances and masterclasses. See below for more information on each camp. Three extraordinary young musicians from Music Generation Laois last night captivated guests at The American Ireland Fund 41st Annual New York City Gala in Pier Sixty, Manhattan, with their superb performance of traditional Irish music and song. U2’s Adam Clayton introduced the performance by 15-year old Sarah Bennett from Portlaoise (Bodhrán, Fiddle), 14 year-old Conall Ó Cnáimhín from Borris-in-Ossory (Cajon, Button Accordion, Fiddle) and 13 year-old Fiadh Fitzpatrick from Portarlington (Uilleann Pipes, Voice), who were joined on stage by their mentor, musician Zoë Conway (Fiddle). These exceptional Young Ambassadors from Music Generation Laois were invited to share their incredible musical skills with guests, as The American Ireland Fund celebrated the achievements of Ireland’s National Music Education Programme since its foundation in 2010. Their repertoire on the night included a traditional set and a rendition of ‘The Foggy Dew’, which was met by rapturous applause. 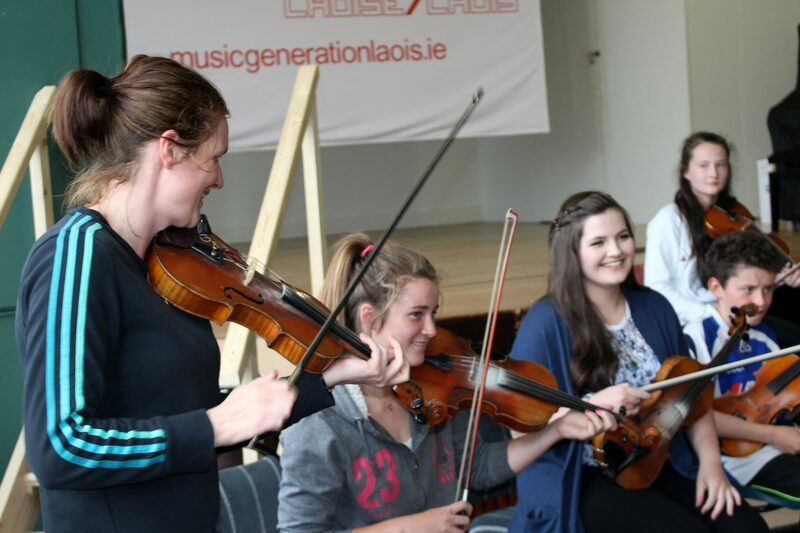 In addition to Laois, Music Generation is currently established in 11 other areas of Ireland, providing access to high-quality subsidised performance music education for some 35,000 children and young people annually and creating 350 employment opportunities. Initiated by Music Network, the programme is currently co-funded by U2, The Ireland Funds, the Department of Education and Skills and Local Music Education Partnerships. The programme is set to expand in up to nine new areas of the country during its next phase, from 2016 to 2021. BODY PERCUSSION WORKSHOP FOR TEACHERS! Music Generation Laois are hosting ‘Body Percussion in the Classroom’ workshop with Ollie Tunmer from Beat Goes On in the Laois Educational Centre, Portlaoise on Tuesday 10 May from 7pm – 8:30pm. FREE TO ATTEND & ALL TEACHERS WELCOME!! New Works Series – Tickets on Sale Now! The Music Generation Laois New Works Series brings young musicians and composers together, to collaborate, compose and perform a series of new works for ensembles in the County. Three composers have been appointed to compose music in collaboration with young musicians. Martin Tourish, composer and accordionist with the Donegal-based band Altan, will work with the Music Generation Laois Trad Orchestra and Choir to create a new twenty minute piece of music ‘1916: Visions and Voices’ to mark the centenary of the 1916 Rising. Elaine Agnew, a renowned composer from Northern Ireland, will work with the Laois School of Music Youth Orchestra to create a new twenty minute piece of music for Youth Orchestra and Choir. Scottish Virtuoso Harpist Catriona McKay will work with the Music Generation Laois Harp Ensemble to create a ten minute piece of music for harp ensemble. The New Works series will be premiered as part of a gala concert on Sunday 22 of May in the Heritage Hotel, Portlaoise. Tickets are €5 and on sale from the Dunamaise Arts Centre Box Office at dunamaise.ie or 057-8663355. ‘1916: Visions and Voices’ is inspired by the actions and events of the 1916 Rising, and is part of the ‘Ireland 2016’ programme of events in County Laois, and funded by the Laois 2016 Community Grants Scheme. All 3 new works are also funded by Per Cent for Art through the Laois Arts Office, and the Music Generation/Arts Council Partnership. Music Generation Laois are offering young musicians between the ages of 12-16 years the chance to apply to participate in a Stomp style percussion project. This project, with Ollie Tumner a Stomp specialist from the UK, will take place in our School building on Railway St Portlaoise. There is a very reasonable fee of €10 to participate (this is for all the sessions). Places are limited. If you wish to apply, send an email to rflannery@laoiscoco.ie by Monday 11 April 4pm including your name, age, instrument, and 3 lines as to why you think you should be selected to participate. Places will be filled based on your application. Initial session is on Thurs 14 April from 5pm-6:30pm. Once the full schedule is completed, and successful applicants feel they cannot commit, the €10 fee will be refunded. Only age 12-16 year olds can apply. This opportunity is only open to current students of Music Generation Laois & Laois School of Music programmes (in schools or in our local tuition centres (classes/ ensembles).